You change the filter on your HVAC system regularly and have undoubtedly noticed all of the dust, dirt and who-knows-what on the old filter. You’re glad to replace it with a new, clean filter to improve the air quality in your home. Your air registers and vents also become dirty over time. Dust, dirt, pollen, pet fur and dander and other contaminants gradually collect behind the floor and wall registers and within the ducts. Some of the contaminated air flows back into the home, becoming the air your family breathes. 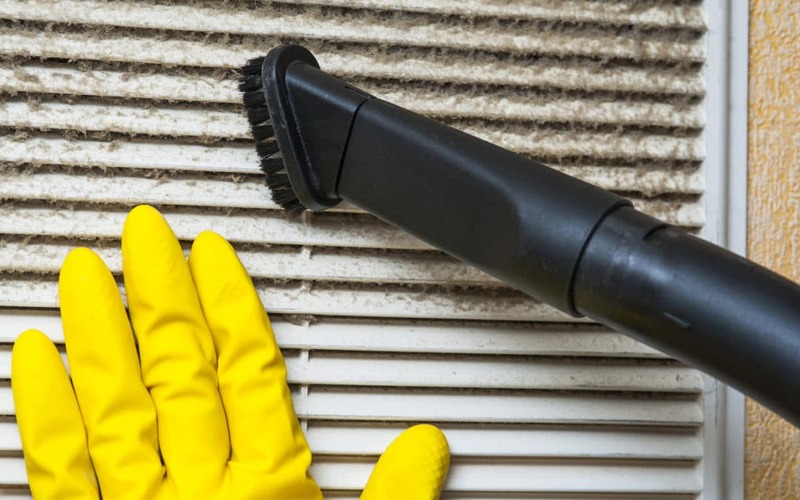 Can You Vacuum and Dust Your Air Vents and Registers? The answer to this question is both yes and no. You can clean the ducts as far as you can reach. Your air ducts, however, extend far beyond the reach of your vacuum. This may be where the worst problems lie. Thorough cleaning requires professional equipment. You can’t get rid of all the dirt with a home vacuum, but many people feel that getting rid of some of the dirt is better than letting it accumulate. 1. Have a new filter ready for your HVAC system. Install it when you’re done cleaning. 2. Turn off the system. You don’t want dirty air blowing into your home while you’re cleaning and loosening debris. 3. It’s usually fairly easy to lift up floor registers. Wall registers must be unscrewed. If the screws are fastened too tightly to remove with a screwdriver, you could use a cordless drill to loosen the screws. 4. Wash registers and vents by hand with hot, soapy water and then leave to air dry. Unpainted metal covers could be cleaned with the dishwasher, but it doesn’t take long to do them by hand. Painted vents or registers should never be put in the dishwasher as the paint could be removed. 5. Use a long brush such as a dryer vent brush to remove debris. 6. Attach the dust brush to your vacuum and remove dirt. Be sure brush is firmly attached so that it doesn’t fall off in the ducts. 7. Wipe down duct walls with a damp microfiber cloth. You’ll find a lot of gunk and need to rinse the cloth repeatedly. 8. Wipe down the floor or walls around the opening. Replace the clean cover. Install the new filter and turn system back on. You’re done! DIY duct cleaning can be done about once a year. A simple, quick vacuuming behind registers can be done monthly. As we said earlier, professional equipment is able to clean all of the ducts, not just a few feet behind the registers. More serious problems are often beyond the reach of the vacuum hose. Rats, mice, insects and other critters can use your air ducts like a superhighway, leaving behind feces and other unhealthy and unwelcome contaminants. The last thing you want is for these contaminants to blow out the vents into the air your family is breathing. Debris, pet dander and other particles gradually collect throughout the ducts and behind the air vents. You can’t prevent dirt and grime from getting into your HVAC system and ducts, but you can slow down the process. 1. Dust and vacuum the home regularly. 2. Replace your HVAC filter every month or at whatever interval is recommended. 3. Have an annual or semi-annual HVAC tuneup. Regular maintenance helps your system run better and last longer. At Progressive Air Systems, we know how important and cost-effective preventive maintenance is for homeowners. It’s always cheaper to fix small problems before they become large, expensive problems. 4. Keep your pets well-groomed. Regular bathing and brushing will keep a lot of fur and dander out of your ductwork. Progressive Air Systems has been committed to providing all of our customers with excellent service since 1985. Honesty is one of our core values and, we believe, one of the reasons we have had so many loyal customers over the years. If you think your ductwork is overdue for a cleaning or you’d like to schedule your annual tuneup, call Progressive Air Systems today at 727-372-5717.